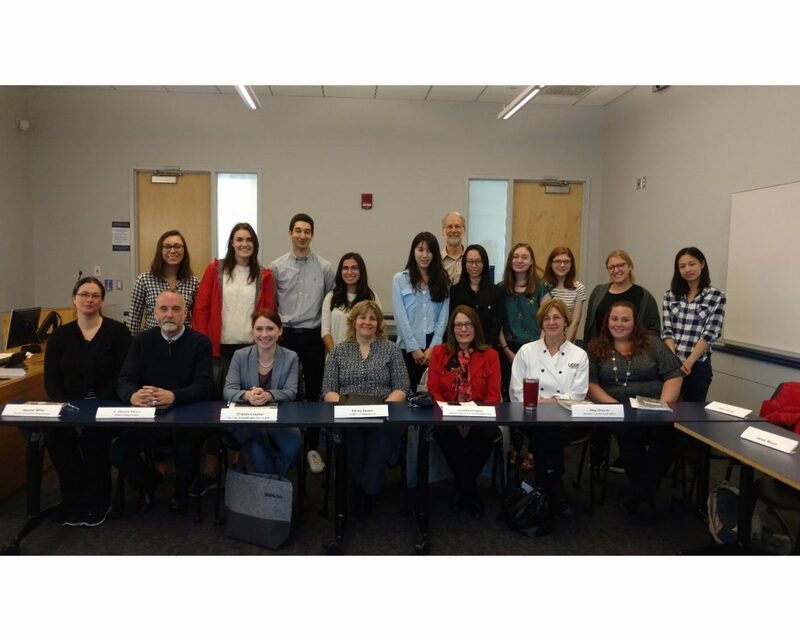 Thursday, April 26th, a team of ten scholars reported their recent findings to an attentive group of representatives from Dining Services and Environmental Health and Safety at UConn. Their goal was to offer informed analysis of interview data about occupational health and safety collected from employees and assistant managers in Dining Services. Who were these influential scholars? They were all undergraduate students, mostly senior Psychological Science majors in Associate Professor Robert Henning’s new “Occupational Health Psychology” course (PCYC 3644). This professional presentation during their last class of the semester was the culmination of a semester of study plus data collection and analysis as a service learning project. In his course description, Henning explains that students in this course will learn about “research-to-practice applications in the interdisciplinary field of occupational health psychology, and how these are used to enhance the safety, health, and well-being of workers.” One major assignment for the course is a service learning collaborative project that challenges students to apply theoretical knowledge to the real world of work. To make this an exciting and authentic learning experience, Henning first sought out the help of Terri Dominguez, Director of Environmental Health and Safety at UConn. She made the initial contacts with Dining Services as a community partner willing to provide access to his undergraduate class. Assistant Director of Dining Services Mike White, always a safety advocate, took the lead role in making the project a reality, including helping to gain support from two local unions. That’s where the most important work, the students’ work, began. After two intensive months of learning theoretical principles and best practices in workplace health and safety, they dedicated one month to conducting interviews with 60 Dining Services staff members serving in a variety of positions across five dining halls to determine how an already robust Dining Services safety program can be made even better. Under Henning’s supervision, students developed the interview protocols, translated the interview script into Spanish, created a qualitative database, and worked to analyze and summarize their findings into a usable format. What did they learn? The students found that workers are acutely aware of the hazards in their jobs, such as heavy lifting, using dull knives, and cooking with hot oil. In addition to making a real effort to manage these hazards every day, workers often have creative ideas for new ways to manage these hazards. The students were also able to report on current practices related to return-to-work after an employee is injured, and the roles of assistant managers and coworkers. Most impressively, the students developed a set of recommendations of their own. One of the most interesting findings was that additional training in leadership and team communication might be an effective strategy to improve workplace safety. This was especially relevant because of the diverse cultural and linguistic backgrounds of Dining Services staff. As Andrea Lopez explained, there is no direct Spanish translation of the word “hazard.” The closest equivalent is “peligro,” meaning “danger.” Why does this matter? Most occupational hazards are not considered immediately life-threatening, which lessens the perception of their severity. This creates an obstacle to recognizing the ability to manage hazards or report them. A hazard, however, is something that cannot always be avoided, and needs to be managed — sometimes requiring a team effort. So what’s next? Many of these students are now new alumni. We have no doubt that they will be able to use the professional analysis and presentation skills they learned and practiced in this course in whatever career path they choose. The benefits of this service learning project are not limited to the students, though. Professionals in Dining Services and beyond at UConn are planning on developing new safety initiatives based on the project findings and student recommendations. Our thanks to Dining Services for supporting this student learning project, and congratulation to Henning’s PSYCH 3644 spring 2018 class. We wish you success in your next big adventure. Students today. Huskies forever. This entry was posted in EHS Major Event and tagged Dining Services, EHS, occupational health and safety, service learning, UConn.